Falafel joints are as Israeli as McDonalds are American. The pita pockets are stuffed with spicy falafel balls (made of mashed and fried garbanzo beans), various salads and vegetables, and often French fries. Tehina, and if requested, spicy sauce, is poured over the whole thing. For a few shekels, one can enjoy a meal which is basically healthy and filling. (No mention of the calorie count will be made here. The balls, fries and some of the vegetables are deep-fried. Dieters can leave out the balls and fries....and the fun). 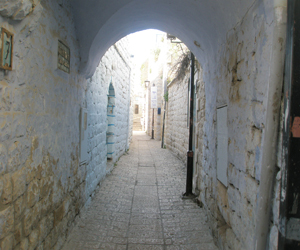 Most cities sport numerous falafel stands, and Tzfat is no different. Parents count on a falafel dinner whenever there's a time-crunch, or on the way to a school activity or sporting event. Kids go to their local falafel stand in the same way that teens in America of the '50s used to go to their local hamburger joint, on dates, with the gang, or simply to get away from mom's cooking for a night. Mothers with young children meet there during the daytime hours with their strollers while the older children are in school, just for a breather. And men come in throughout the day for a meal, a snack, or just to check the latest sports scores and news. Falafel California, located on Tzfat's busy Jerusalem Street, is one of the most popular falafel joints in Tzfat. It's impossible to say exactly why. It's certainly no larger than any of the other stands in town. The food, falafels or shwarma (sliced meat with vegetables in pita), while tasty, is not necessarily any better than any of the other spots in town. Mostly, it's the atmosphere..... friendly, easy-going, and pleasant. The owners who work there whip the falafels together quickly while chatting with the customers about everything from the local school sports' scores to the latest political messes in the Knesset. "What do you want in your falafel?" is the first question you'll be asked when ordering a falafel. No matter how many people are talking at once, they never seem to get it wrong. "Three balls, chips, tomatoes, cucumbers? No eggplant? No cabbage? Any tehina?" And while they're putting the concoction together, you can enjoy an earful about the day's topics. "How is your son doing at his school? I was thinking of putting my son there, but he wants to go to the other one. What do you think about Netanyahu? Does he have a chance these elections? I'm really worried about his #2 on the list......"
The staff knows their customers too. "Two balls, lots of chips, no vegetables? This must be for your daughter. That's what she always gets when she comes here. What about the other one? All the vegetables except tomatoes? Why don't you tell your son that tomatoes are good for him? What do you want on yours? No spicy sauce, right? I remember when I put some on for you once and you practically drank my tap dry....."
The world might be getting more complicated as we move through the 21st century, but it's comforting to know that neighborhood joints like Falafel California are not going out of style.